Today in this post I will tell you how you can control speed of songs or videos while playing. If you are listing to a song which playing very fast and you want to slow down that song so that you can understand the lyrics of that songs or if you are watching a movie and in that movie some sense are very slow and want to fast-forward that sense but you don’t want drag the timeline because you want to watch and listen everything. 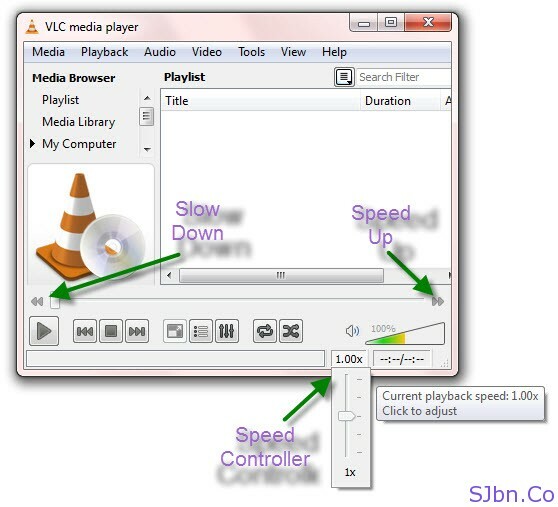 So let tell you what you can do if you are using VLC Media Player. VLC Media Player has two options by which you can control the timeline speed. First option you will get both at the side of timeline by which you can Slow Down and Speed Up timeline speed and the other option you will get below the controller of time line (as you can see in above image). When you change the speed of timeline it will not mute the volume or break your video (depending on speed you set). It will work in all the formats which are supported by VLC. If you have any question or problem let me know.